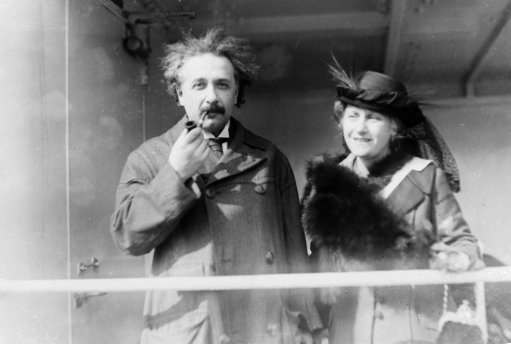 Professor Albert Einstein and his wife Elsa arrive from Palestine to raise funds for Zionism, April 4, 1921. 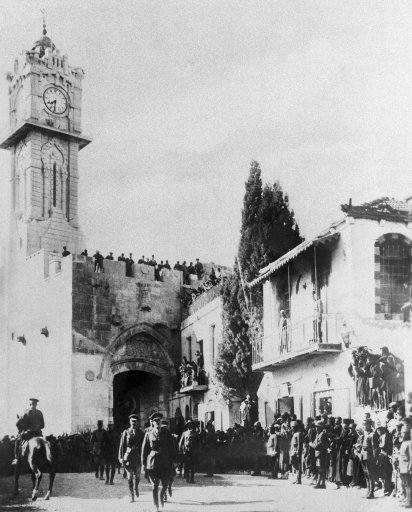 General Allenby (British) enters the captured City of Jerusalem, Palestine, Dec. 9, 1917. He entered on foot thru the Gate of David. 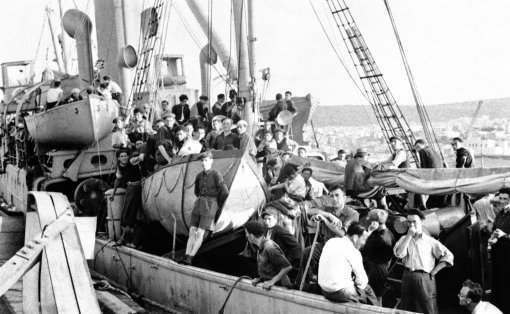 Jewish refugees, arriving on April 14, 1920 in Haifa, Palestine, aboard the Theodore Herzl. Some are carrying on their shoulders the bodies, in white shrouds, of two of their compatriots, who they say were slain when the Theodore Herzl was boarded by British personnel after unsuccessfully attempting to run the British Blockade. 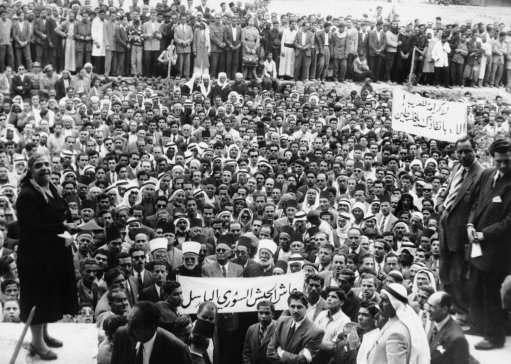 Some 10,000 of the 48,000 Palestine Arab Refugees who have settled in and around Damascus, Syria, staged a demonstration in Damascus, last week in April 1929 to express their gratitude to the Syrian Army for the recent Syria-Israel border clashes. They asked to be accepted as volunteers for the Syrian fighting forces so that they night fight back at Israel, upon which country they blame their present unhappy condition as refugees. Photo shows: An elderly lady addresses a great crowd of Palestine Arabs in the court-yard of the Army General Headquarters in Damascus. Her speech was among others heard there by Syrian Officers. 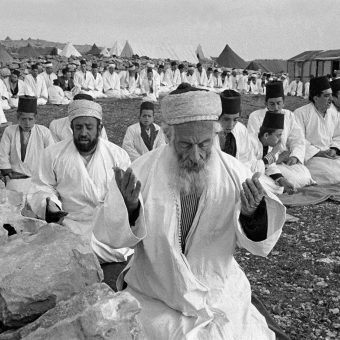 On Mount Gerizim, outside Nablus, in central Palestine, there is an ancient Jewish sect known as the Samaritans, which claim to have lived in the Holy Land continuously since the time of Moses. At Passover they conduct the ancient sacrifice of a lamb upon an altar. 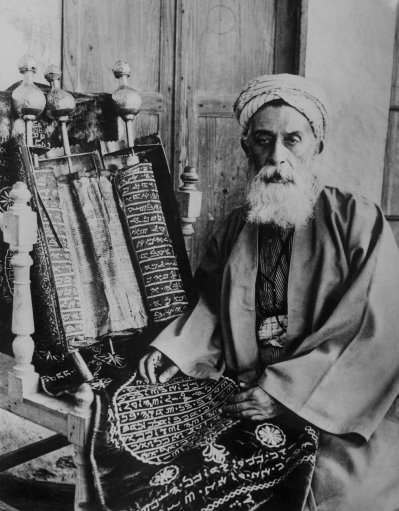 Aaron, the high priest of the Samaritans with some of their laws, inscribed on ancient scrolls in the Aramaic text shown May 16, 1930. 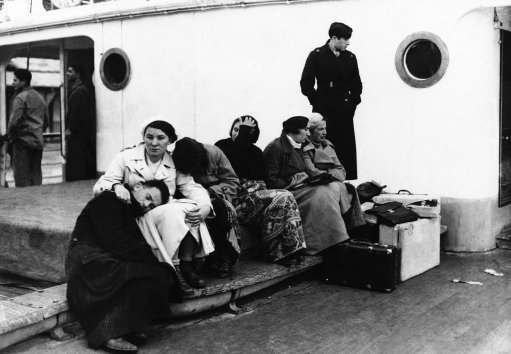 The tired groups shown above on the ship King Carol were a part of 318 homeless Jews barred from entering Palestine by the Quota system restricting immigration on Dec. 5, 1934. 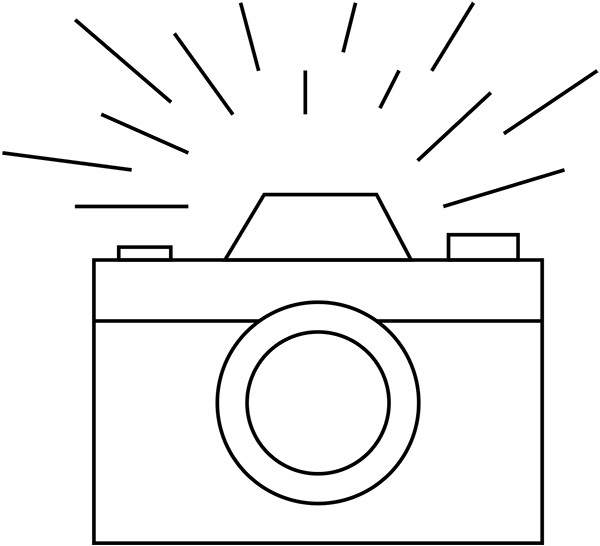 For two months they wandered vainly seeking a country where they would be permitted to land. Finally the polish government consented to receive them and they were landed at Constanza, Roumania and transported to Poland by train. 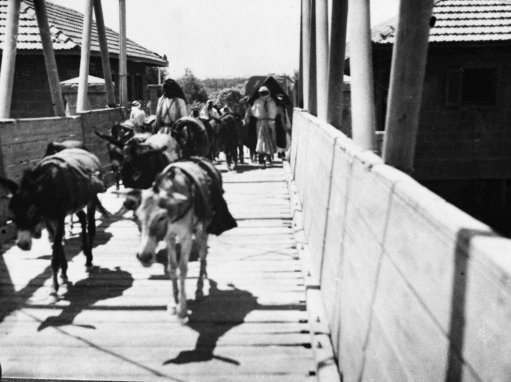 A train of donkeys crosses the Allenby Bridge, over the River Jordan on July 3, 1936, from Jordan into Palestine. 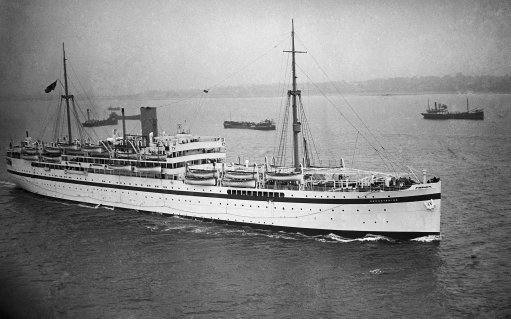 The troopship Dorsetshire, with members of the Royal Northumberland Fusiliers, Royal Irish Fusiliers and Royal Engineers regiments on noard, sails from Southampton, England, on Sept. 12, 1936, enroute to Palestine, where the troops will reinforce the existing force out there. 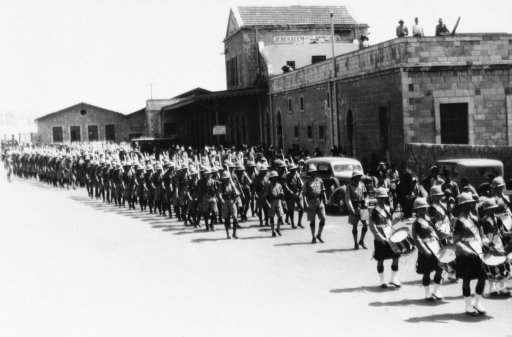 The British military authorities in Palestine have virtually taken over the railways, and there are unmistakable signs of military control along the line from here to Tel Aviv, Sept. 22, 1936. Special arrangements have been made to guard the line for fear of sabotage. 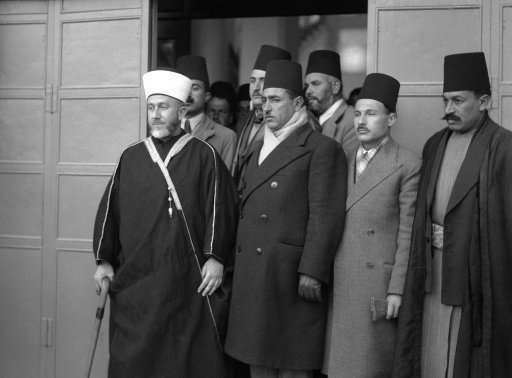 The leader of the aran revolys in Palestine Fawzi Bey Al Qavoukchi, on Sept. 28, 1936. 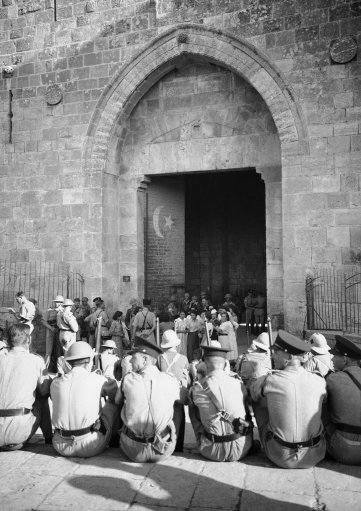 The royal commission to investigate conditions in Palestine started work at the reception held at the government house in Jerusalem, Israel on Nov. 12, 1936. Lord Peel, chairman of the royal commission, reading his opening speech. 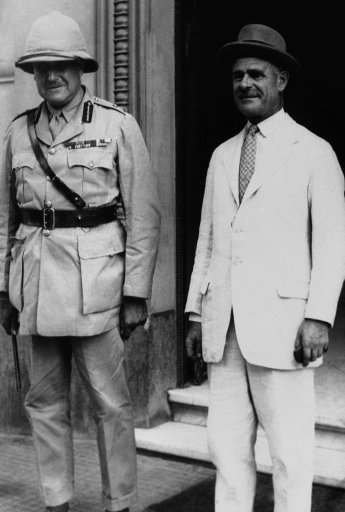 Sir Arthur Wauchope, high commissioner for Palestine is seen on left in armchair. The members of the commission are left to right: Sir Morris Carter, Sir Horace Rumbold, Vice-Chairman, Lord Peel, Sir Laurie Hammond, Sir Harold Morris, and Mr. Reginald. 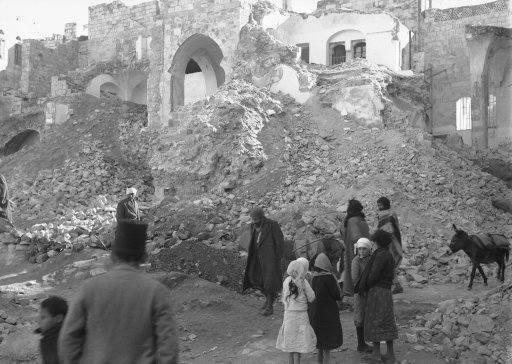 Funds are being raised in Nablus to rebuild the structures demolished by British troops during the Arab Reign of terror. 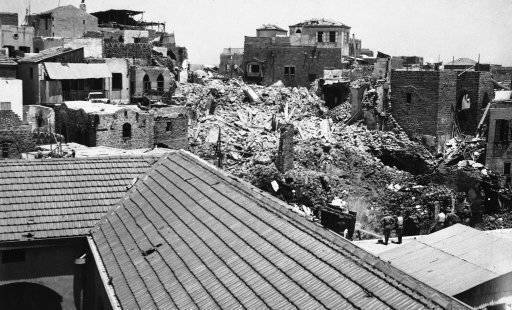 The ruins of a building in Nablus which the British Blew up because it was used by Arab snipers on Jan. 12, 1937. The Mufti of Jerusalem appeared before the Royal Palestine commission on January 12 as the first spokesman for the Arab Case. 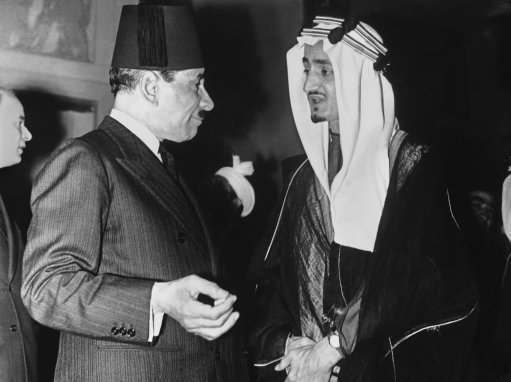 For two months the Arab higher committee, headed by the Mufti, declined to co-operate with the commission. The decision to testify came after the Arab sovereigns of Iraq and Saudi Arabia and appeared to the committee to appear before the commission. 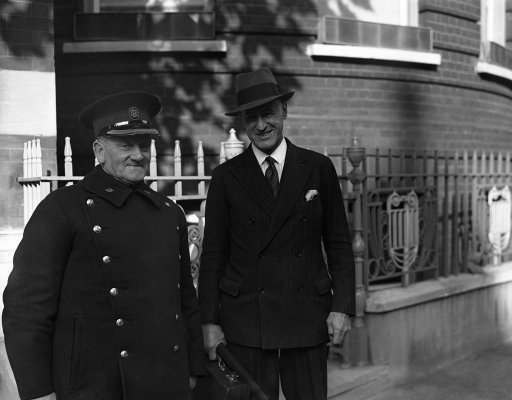 The Mufti (left) leaving the offices of the commission after his testimony on Jan. 12, 1937. 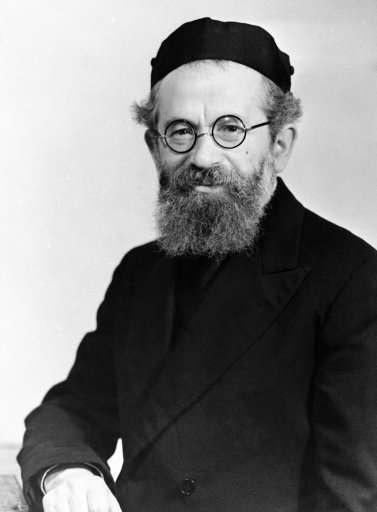 Rabbi Isaac Hertzog of Dublin arrived in Haifa, Palestine, Israel on Jan. 15, 1937, to take up his duties as Chief Rabbi of Palestine. He succeeds Chief Rabbi Kook, who died 16 months ago. 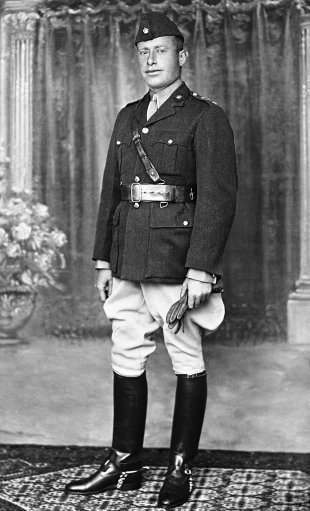 Sir Charles Tegart, the man who suppressed terrorism in Bengal and who earned the title “Man of Iron,” is going to Palestine to advise the government on police organization there. Mr. Ormsby-Gore, colonial secretary, who made the announcement, said that the immediate and primary duty of the government and Palestine administration is to take vigounous measures to combat terrorism. 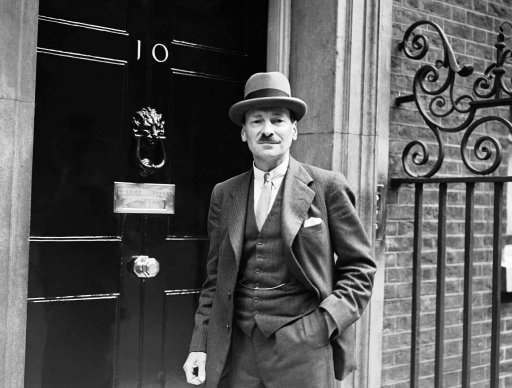 Sir Charles Tegart in London on Oct. 22, 1937 after the announcement of his visit to Palestine. 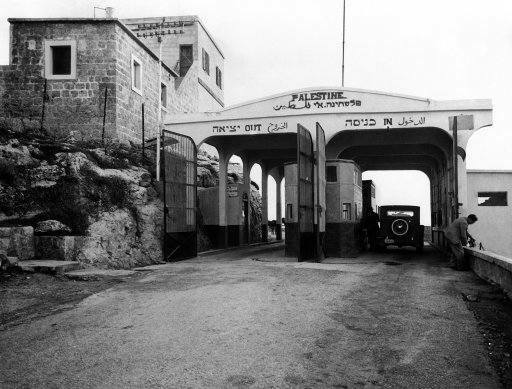 The gateway from Syria into Palestine, Jerusalem in 1938. 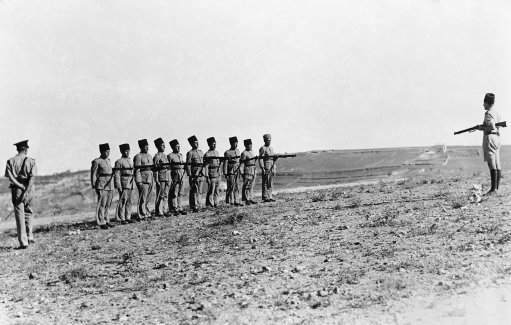 Owing to the secret entry of thousands of Arab Rebels from Syria and the Lebanon into the Holy land, strict watch must be kept by the French and British police at the frontier. 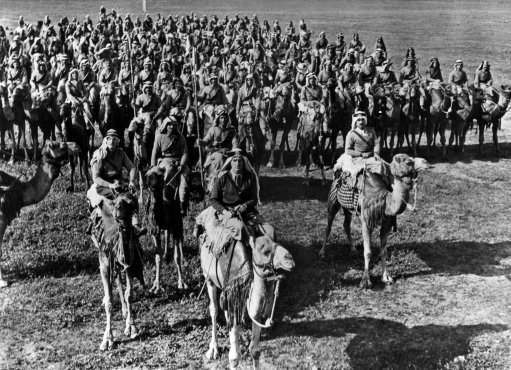 British troops, reinforced by new arrivals are concentrating on the Galilee area north Palestine, in the General hunt for Arab rebels on Jan. 11, 1938. 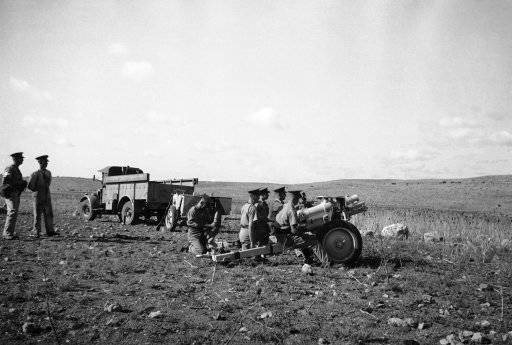 New rubber tired British 3.75 howitzers bombarding rebels in the Galilee (north Palestine) area. With a rifle at hand to stave off further attacks, this group of Jewish colonists, aided by Arab villagers, String barded wire in the 50 mile, tegarts wall, on the Palestine-Syria border on July 20, 1938 after bands of Marauding Arabs damaged the fence and engaged police in rifle fire. Arab bands and colonists have engaged with fatal result in clashes throughout July. 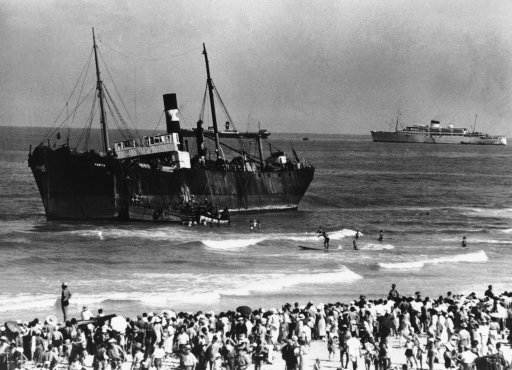 The lighter basin, with two big goods sheds in the background, at Tel Aviv, which took its place alongside the great port cities of the world when the high commissioner for Palestine, Sir Arthur Grenfell Wauchope, declared the “baby” port open for passenger traffic, during the ceremony, much of which had to be curtailed owing to heavy rain, a crowd with hoisted umbrellas can be seen in rear of the picture on Feb. 23, 1938. 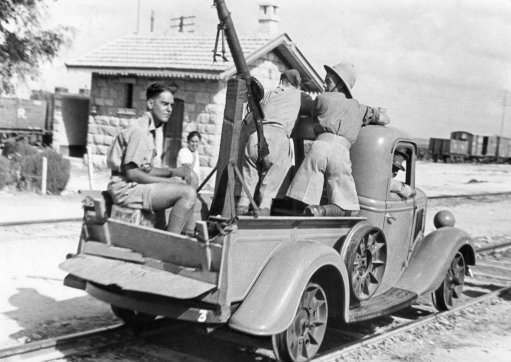 Volunterr Jewish soldiers who prevent interference with the American-Jewish colonies in Palestine, Israel on August 23, 1938. 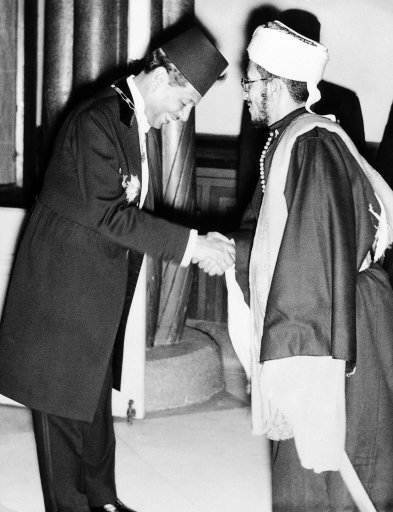 They are being called upon a lot during the present Palestine Troubles. 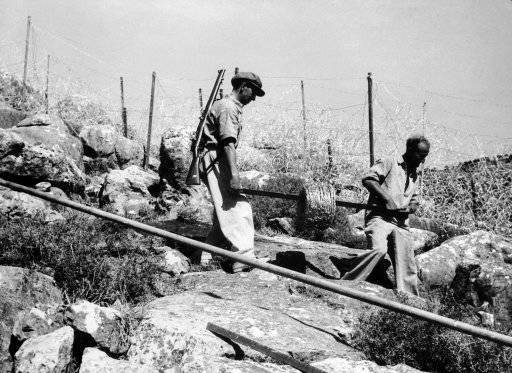 American Jewish colonists in Palestine completing the so called Tegart fence on August 23, 1938, which cost 500,000 dollars to build. 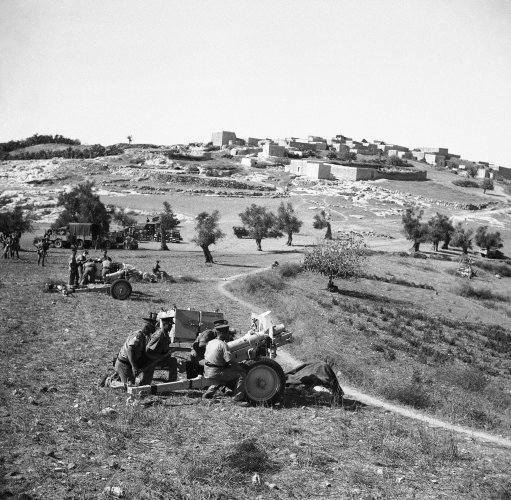 It is 75 kilometres long, on the Palestine-Syria border, was suggested by Sir Charles Tegart, part of the British scheme to stamp out the Palestine disorders. 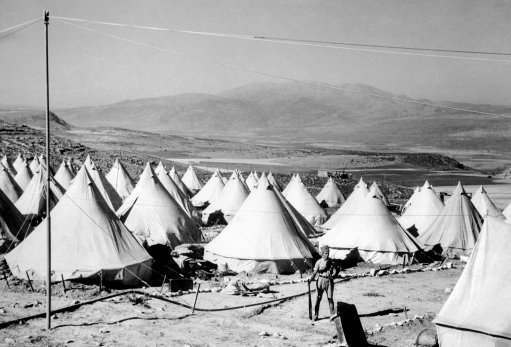 Tent colony of American-Jewish settlers near Jerusalem, Palestine, Israel on August 23, 1938. It is under constant guard during present troubles. 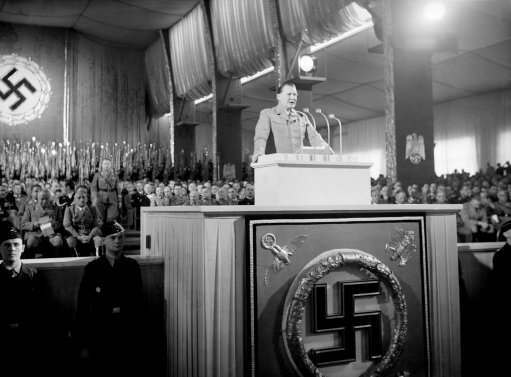 Field Marshal Hermann Goering makes his dramatic speech at Nuremberg, Germany on Sept. 10, 1938. In a violent two-hour polemic at Nuremberg, Field Marshal Goering attacked the Czech government, boasted Germanys vast food stores were sufficient to defy any blockade, that her western fortifications were impregnable and that her air force was the strongest in the world. He also criticized England, pointed to the unrest in Palestine. 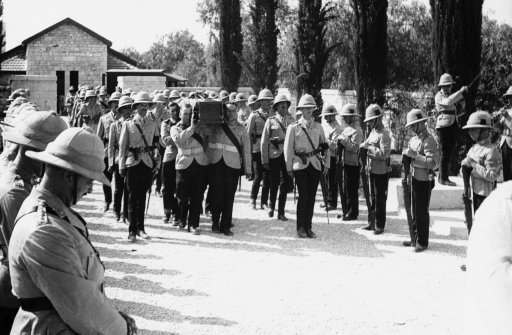 Funeral for British army victim of the Arab revolt in Palestine, who was buried with full military honors by his comrades, at Ramla, near Jerusalem, Sept. 9, 1938. 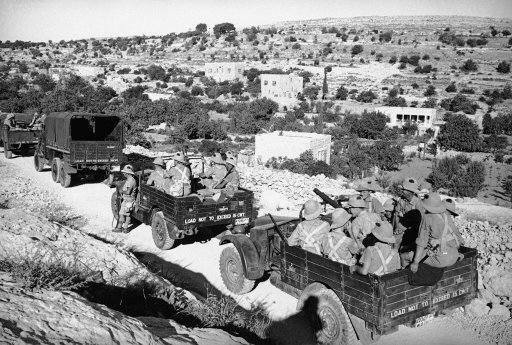 War trucks filled with fully armed British soldiers are shown on the road to ancient Hebron, city of the holy land, Israel on Sept. 5, 1938, where radial religious strife threatened to destroy the Biblical town. The town was sacked by Rebel Arabs, the driver of a British tank was slain and buildings were burned in the cut break which brought these motor lorries dashing to the terror torn city. 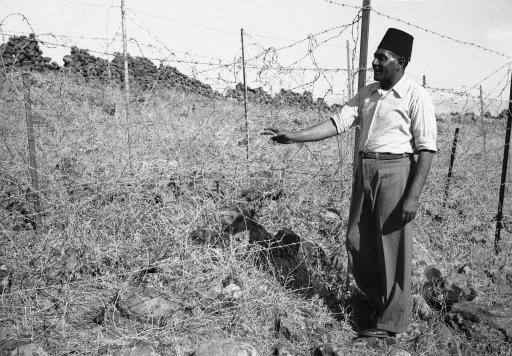 An Arab stands beside a section of ìTegartís Iron wallî in Israel in 1938, erected by Sir Charles Tegart to keep marauding Arabs out of Palestine. The fence, three strains of barbed wire on angular iron supports. Stretches for 60 miles on the Syria-Lebanon borders and cost $ 500,000. 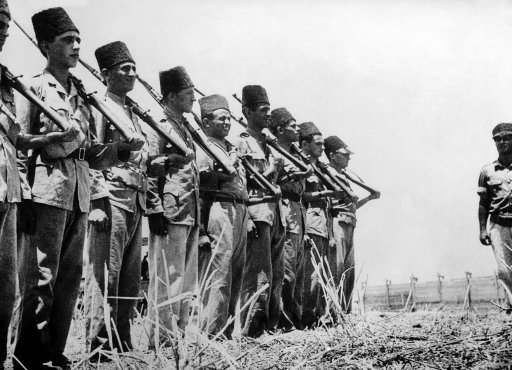 This time suppression of the Arab rebellion in Palestine is the British soldiers lot. After months of terrorism, loss of lives in the hundreds and loss of trade in the millions, Britain apparently is determined to halt the terror and is dispatching thousands of additional troops. 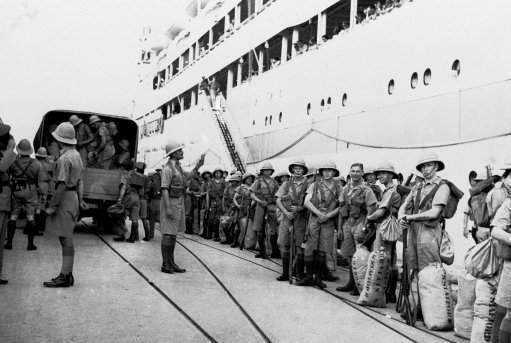 Photo shows Tommies after disembarking from a transport at Haifa on Oct. 11, 1938, when they were to be assigned to the duties in Jerusalem and other disturbed points. 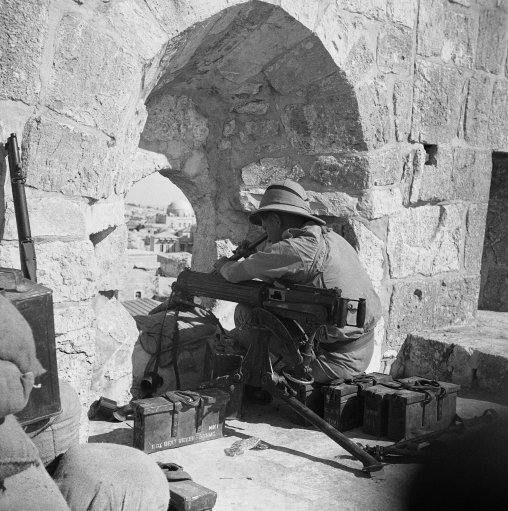 British troops in action in Palestine, Israel on Oct. 19, 1938, during the reconquest of old Jerusalem from great rebel. 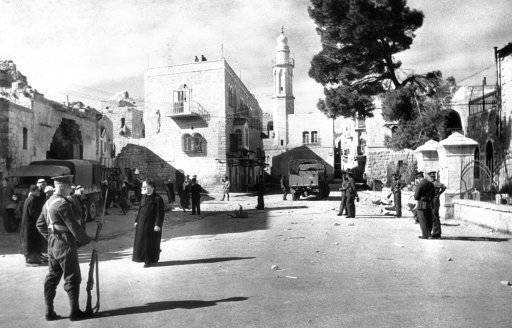 Since the British occupation of Jerusalem, Palestine, after the old city had been held for four days by Arabs, a measure of calm has descended on the district. Storm centre October 24óWhen this picture reached London by air after being was Jaffa, where there was sniping. 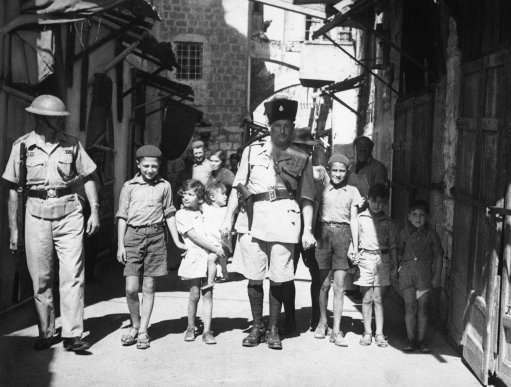 British police captain leading Jewish kiddies to safety away from Arab snipers during the reoccupation of the old city of Jerusalem in Palestine, Israel on Oct. 24, 1938, by the British. The authorities are still making a determined bid to wipe out bands of rebels who are terrorizing Palestine. 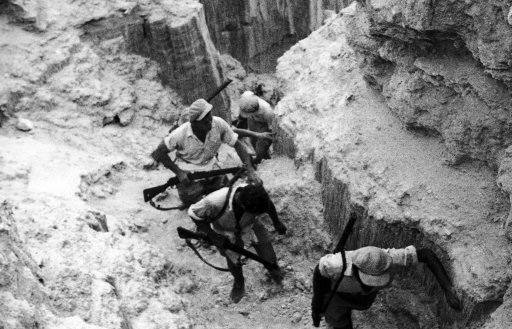 Volunteer “terror squad” of police-helpers, armed with rifles, scouring the mountains of Samaria, central Palestine, in pursuit of rebels on Oct. 24, 1938. 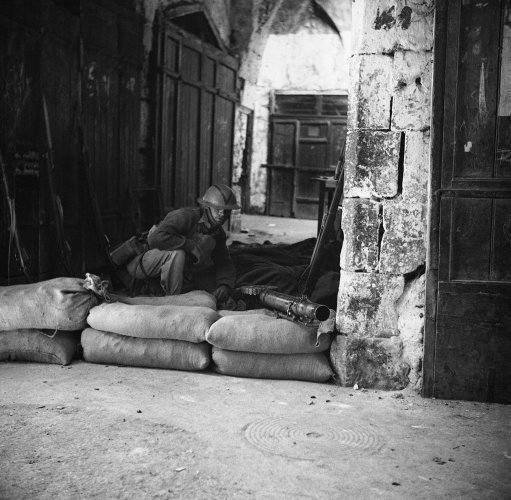 British machine guns and sandbag barricades are set up in the courtyard of the Church of the Nativity in Bethlehem, Palestine, Oct. 26, 1938. 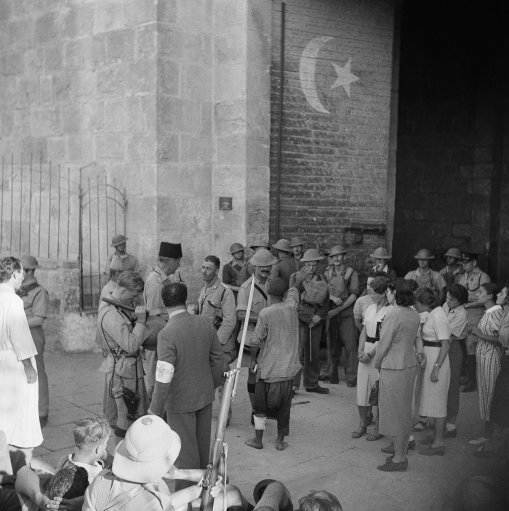 British soldiers resting at the Damascus Gate in the Holy City November 1938. Fakhri Nashashibi; Member of Arab National Defence Committee is challenging the leadership of the ex-mufti of Jerusalem, Haj Amin Effendi Al Husseini, in exile in Syria. Nashashibi, who comes from one of the most distinguished Arab families in Palestine, says the ex-mufti is no prophet but a self-seeking politician, who is running Palestine by his campaign of terror. 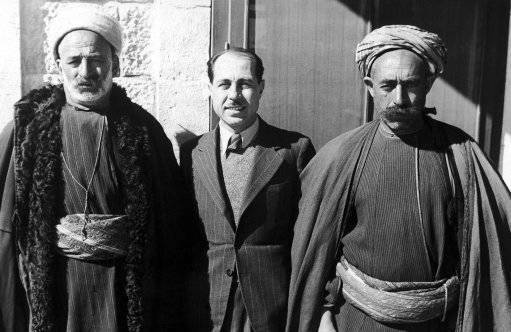 Fakhri Nashashibi stands between two of his chief supporters (tribal heads from the Hebron District) in Jerusalem on Nov. 24, 1938. 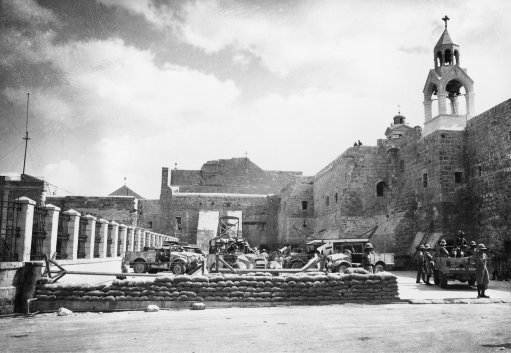 The British Army, strengthened by newly arrived reinforcements from England, Malta, India, and Egypt are conducting an intensive drive against Arab Rebels in historic Galilee, Northern, Palestine. 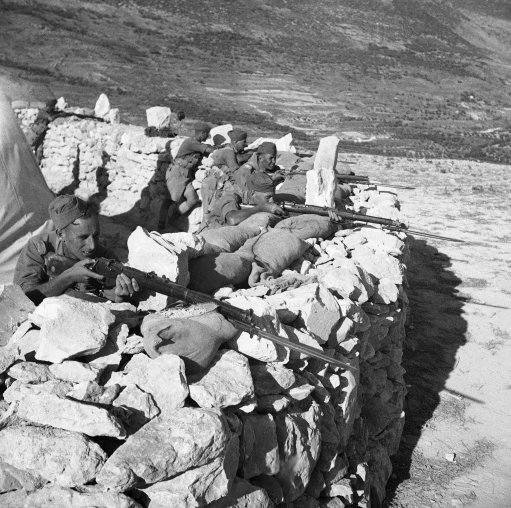 British riflemen in action against Arab rebels at a mountain outpost in Israel on Nov. 10, 1938. 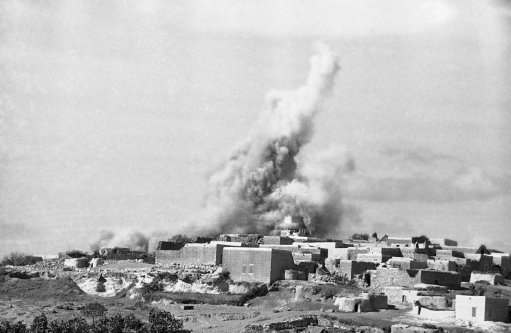 The British army dynamites Arab stone houses in northern Palestine in reprisal for rebel activities, Jan. 9, 1939. 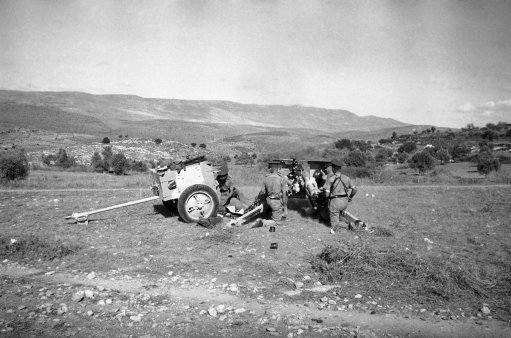 Latest British artillery with rubber-tired wheels, in action against Arab rebels in Palestine, Jan. 9, 1939. 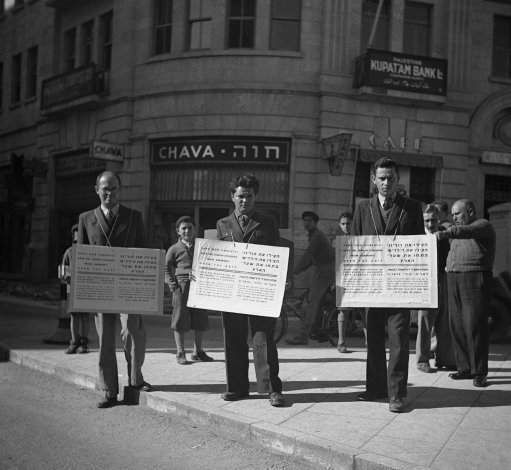 Save our children and our parents! say these Jewish placards carried by men in the streets of Jerusalem, Israel on Jan. 16, 1939. Open the gates of Palestine to the times of Nazi prevention hatred at the Christmas period we are crying from the holy city of Jew Salem to all Christian nations to help us against Germany. Palestine has been the scene of much death and destruction during the past two years, consequent on the conflict between Arab and Jew, and Jerusalem the holy has not escaped from scenes of violence. 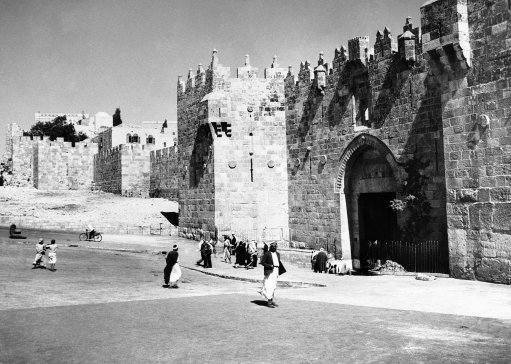 The famous Damascus gate of Jerusalem, scene of many incidents that have affected the history of Jerusalem and Palestine in an undated photo. This leads from the new city to the old quarter and is regarded by both factions as of strategic importance. 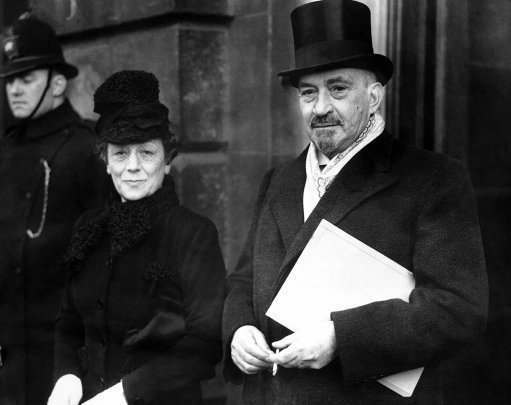 Rabbi Dr. Stephen Wise, who is to represent the interests of Zionist Jews at the forthcoming conference on Palestine problems at St. James’s Palace on February 4 arrived in London, where he was welcomed by Mr. Malcolm MacDonald, the secretary of state for the colonies, on behalf of the British government. 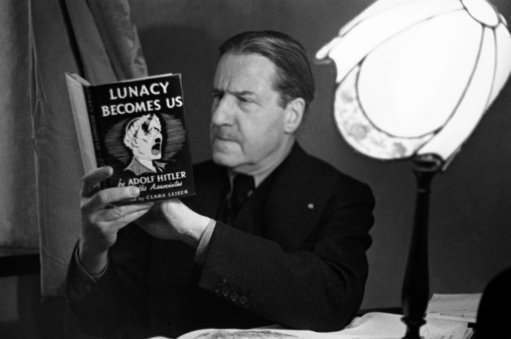 Rabbi Dr. Stephen Wise fills in his leisure moments at his London hotel after his arrival on Feb. 4, 1939, by reading a book dealing with Herr Hitler, as can be seen from the picture. 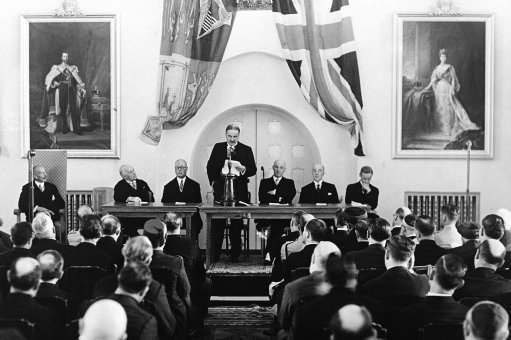 The Prime Minister opened the conference on the future of Palestine in the old Banqueting hall at St. James’s Palace in London on Feb. 7, 1939. 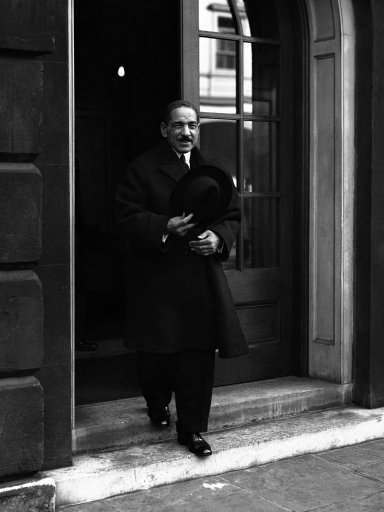 Mr. Chamberlain opened the discussions with a speech to the Arab delegations at 10.30 A.M., and at midday, he made the opening speech to the Jewish agency delegation, this course being necessary because the Arabs not recognize the Jewish Agency as a body with whom they can treat. 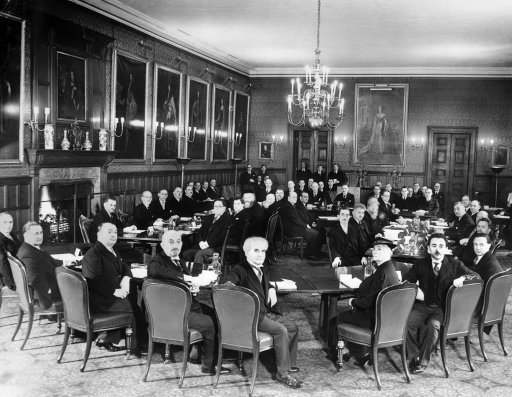 A general view of the first meeting of the Jewish of the conference at St. James’s. 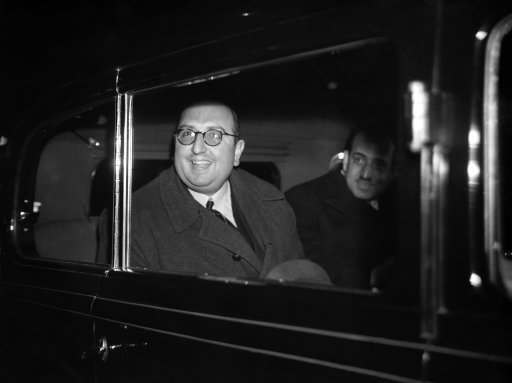 The Arab centre party who are now in London, to attend the deliberations of the conference on Palestine now meeting daily at St. James’s Palace, gave a reception and tea party at the Hyde Park hotel on Feb. 8, 1939, to the other Arab delegations to the conference, including the delegations from the Yemen, from Egypt, Iraq, and Palestine. 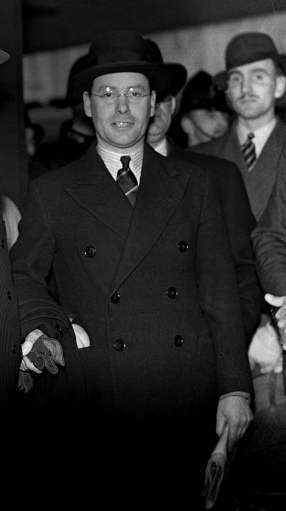 Mr. Malcolm Macdonald, the British minister for the colonies, was among the number of distinguished guests. 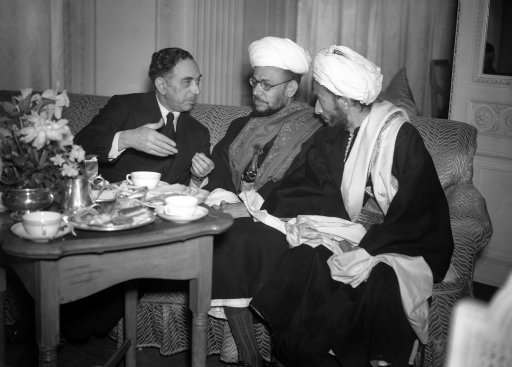 Nuri el said Pasha, the Iraqi minister, left, with the Yemen delegates, Al Qadhi IBN Hussain Amri (with glasses), and Al Qadhi Muhammed Abdullah at the Hyde Park hotel. 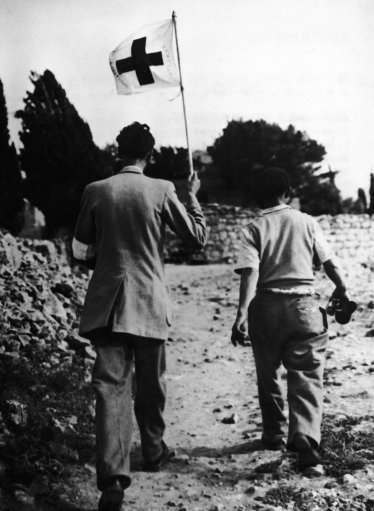 Swiss Jean Courvoisier, staff member of the Red Cross in Jerusalem, holds his organization’s flag as he walks together with an unidentified colleague on no man’s land in search for victims of the Jewish Arab conflict on May 10, 1948 in the Katamon outskirts of Jerusalem, Israel. Despite of the flag he was shot on twice by Arab snipers. 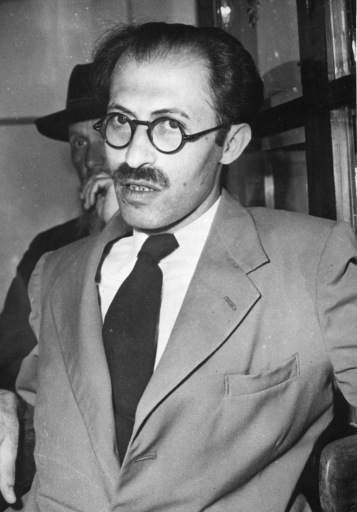 Menachem Begin, at his home in Tel-Aviv, Israel, March 25, 1948, is the leader of the Herut party in the Republic of Israel. The party is the strongest opposition party to prime minister David Ben-Gurion’s Mapai party. Begin led one of the biggest terrorist gangs theat fought the British before the state of Israel was created. In 1948 the British placed a 30 000 Pound reward on his head, dead or alive. Now he is considered the number two man on Israel’s political scene and he has been a strong opponent of Ben-Gurion’s solution of the Gaza problem. 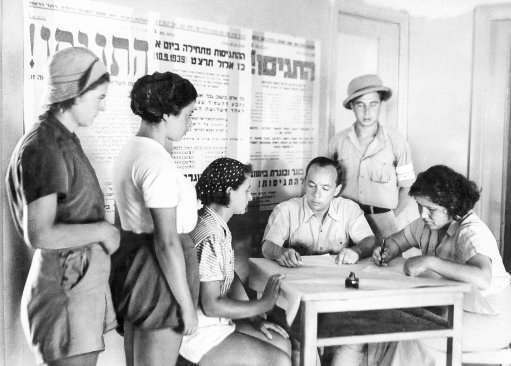 With registration on full swing, Haganah, the Jewish defense organization, puts all recruits through stiff training courses on March 11, 1948 in Jerusalem. There are several such camps, set up in secret locations. Besides training in the sued of arms, the youths are pout through a strenuous body conditioning program. 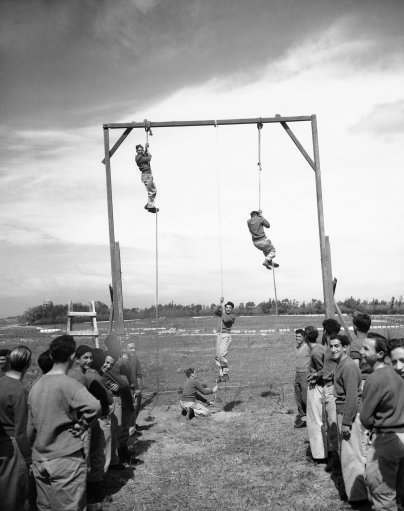 At one stage of training, the recruits climb hand-over-hand up hanging ropes. 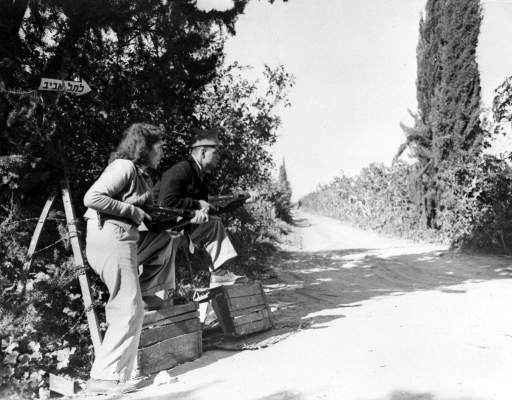 Members of the Jewish Defence Oraganisation Haganah, armed with sten guns, keep guard in an orange grove, near Rehovoth, Palestine, March 8, 1948, after arabs had attacked Jewish buses and convoys in the area. 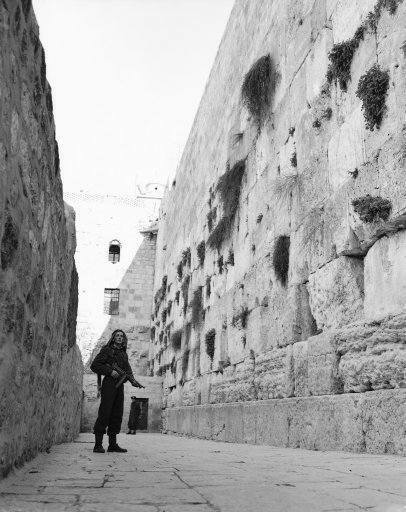 An Arab, armed with a sub-machine gun, stands guard at Jerusalems Wailing Wall on Feb. 23, 1948. Jews are being kept from this centuries-old holy place by Arabs for the first time since the Arab-Jewish disorders in 1939. 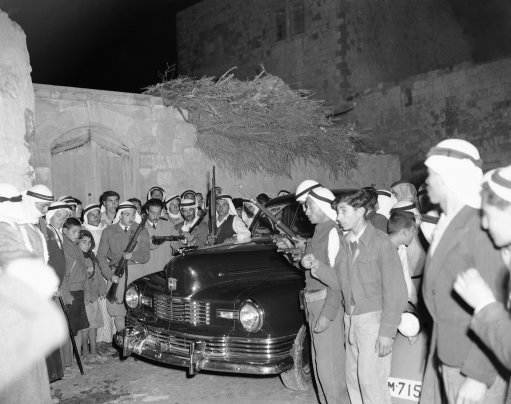 Armed Arabs surround the press car of American and British correspondents as the newsmen arrive at Taiba on a tour of Arab villages in Middle Palestine on Feb. 10, 1948. 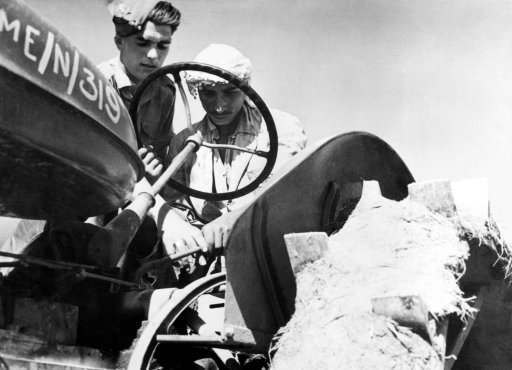 The correspondents encountered frequent roadblocks set up by the Arabs to keep a close check on traffic in fear of Jewish attacks. 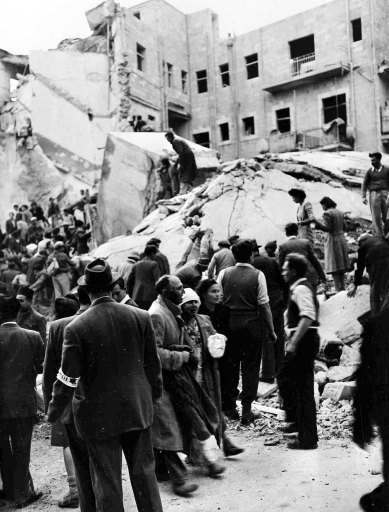 An injured Jewish couple walk past rescuers searching for wounded and dead people in the wreckage of shops on Ben Yehuda Street, Jerusalem, Feb. 22, 1948, after a bomb exploded. The bomb killed 52 Jews and wounded 100 more and levelled buildings on both sides of the street. 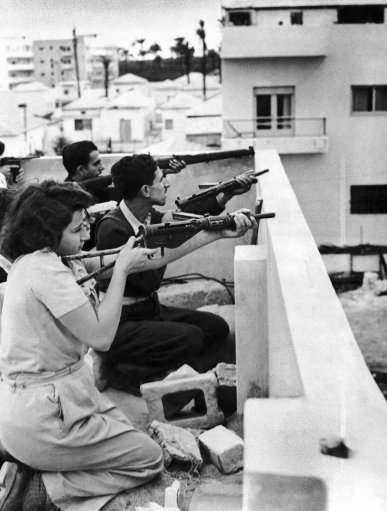 Members of the Jewish right-wing underground organization Irgun Zvai Leumi (National Military Organization in the Land of Israel) are armed with rifles, revolvers and automatic weapons as they take position on the rooftop of a Jewish house in case of Arab attack on the Jaffa – Tel Aviv border in the Manshiah Jewish quarter in Tel Aviv, Israel, on December 27, 1947. 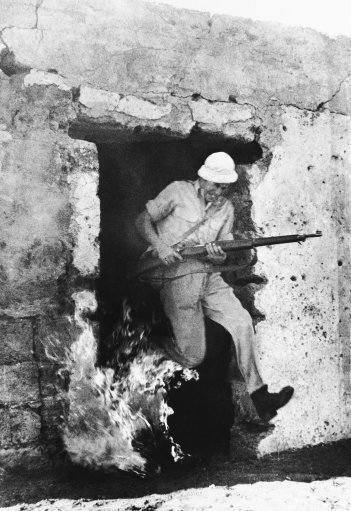 The Zionist guerrilla force began an armed revolt against British rule in Palestine. 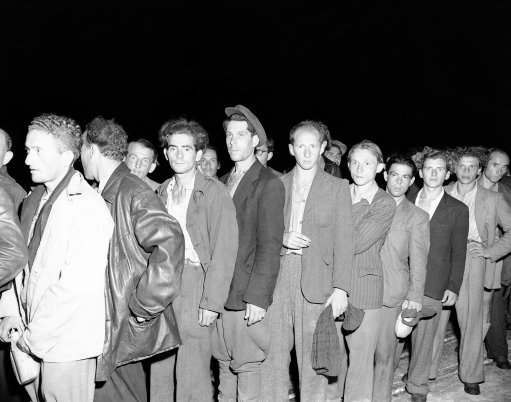 Young men and women from 17 to 25 years of age, called up for essential duties, principally military, started registering for the Jewish army. 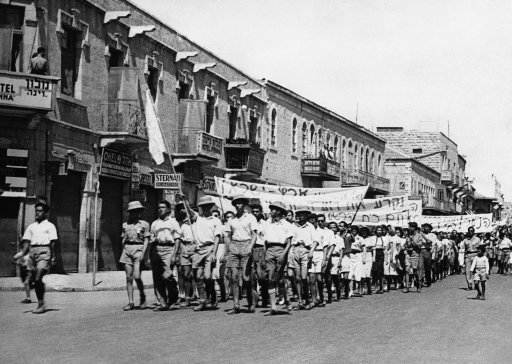 Although many are members of the semi-official Haganah, there were other youngsters eager to sign up to defend their homes against an Arab invasion. 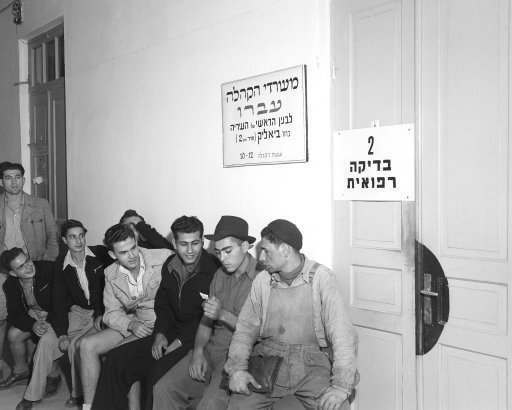 Volunteers wait for medical examinations in Israel on Dec. 16, 1947. 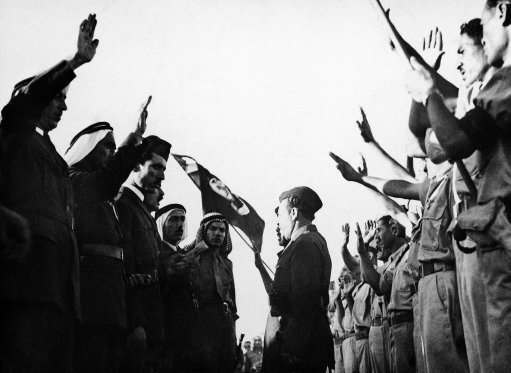 Volunteer Arab soldier for the private Army of the Jerusalem Grand Mufti are sworn in on December 15, 1947 at Abu Dis, a small Palestinian village, near Jerusalem, Israel. 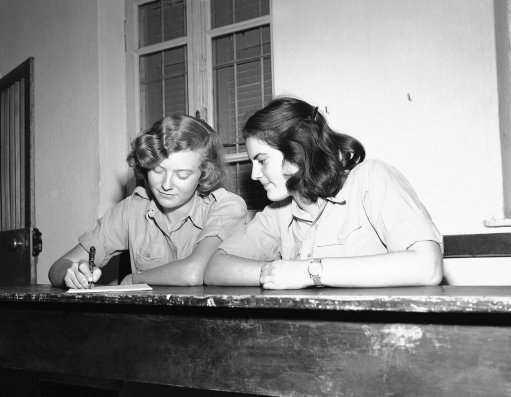 Two Jewish girls fill out their registration forms for the Jewish Army in Israel on Dec. 16, 1947. Many are now members of the semi-official Haganah. 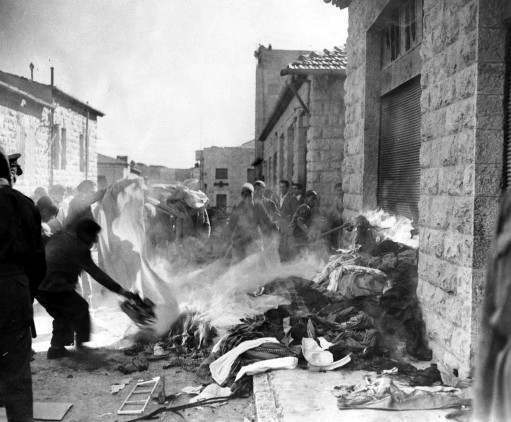 A crowd of arab demonstrators burn goods taken from Jewish homes in Jerusalem, Dec. 6, 1947, during the disturbances which broke out as the arabs staged a three-day strike against the partition plan. Jewish shops and homes in the quarter were attacked and some set on fire. Jews who have been the enemies of the British for the past few years, have made up after hearing of the news of the declaration of the new Jewish State of Israel. 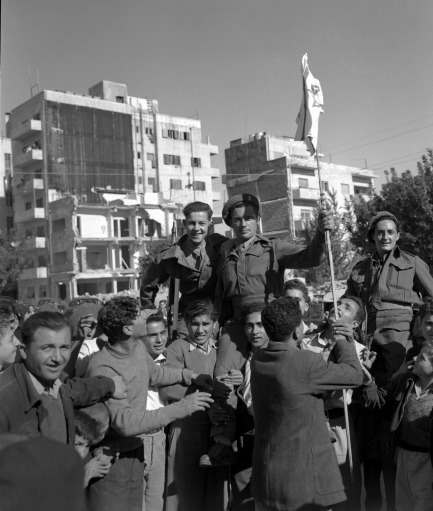 Jews are seen hoisting British soldiers on their shoulders and holding the Israeli flag on Nov. 30, 1947 in Jerusalem. 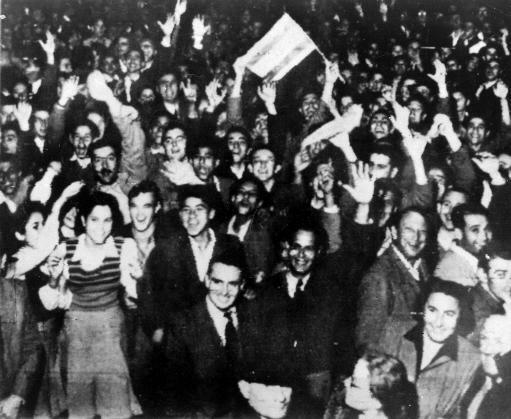 Jewish residents wave jubilantly in the streets in Tel Aviv, Israel. 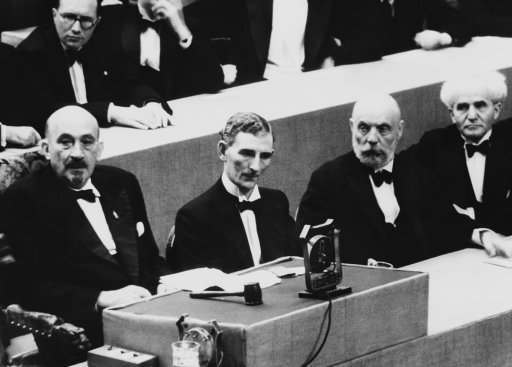 Celebrations began after the United Nations voted to partition Palestine into separate Jewish and Arab states. 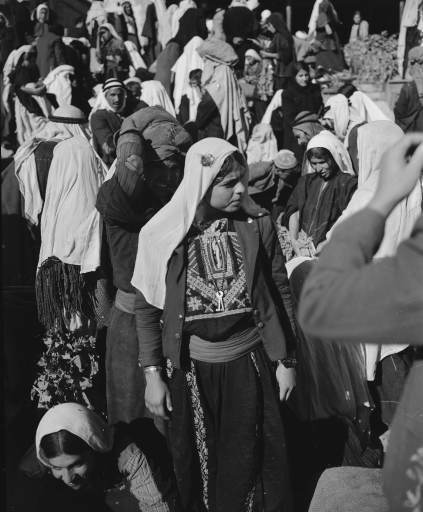 Arab girls shop in the market place near Manger Square in Bethlehem, Nov. 28, 1947. 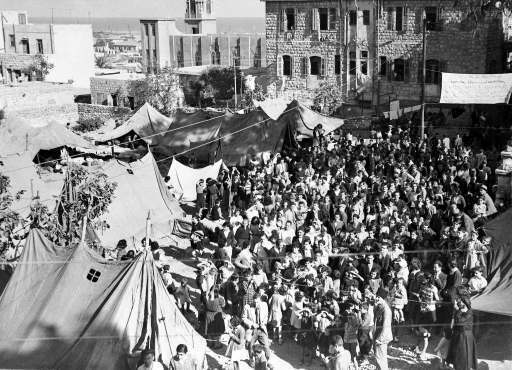 Some of the thirteen hundred Palestinian Armenian from Jaffa, Jerusalem and Haifa, in the tent camp in the grounds of the Armenian Church, Haifa, Oct. 29, 1947, where they are waiting for transport to Soviet Armenia. The Illegal refugee ship Af al pi docked at Haifa, Israel, on Sept. 9, 1947 after it was intercepted in Palezine waters by the British Navy. 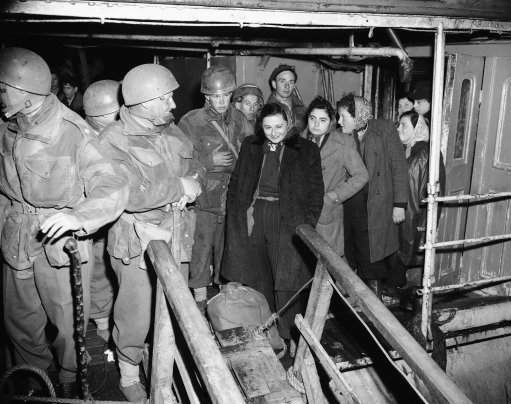 The ship was a former LCT landing Craft Tank and was at sea with its 445 passengers for two weeks during the boarding operations one Jew was killed by gunfire and a number injured. The disembarkation took place with out incident. The Illegal were sent to Cyprus, a party of eight of the people including three sick women and one injured man were transferred to go Government Hospital Haifa. 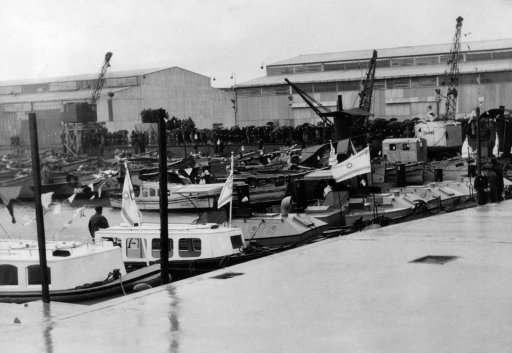 General View of the Af Al Pi at the pier showing bearding party on deck General view of the refugees coming out of the holds Boarding party about, show in photo are, Jews lined up on pier. 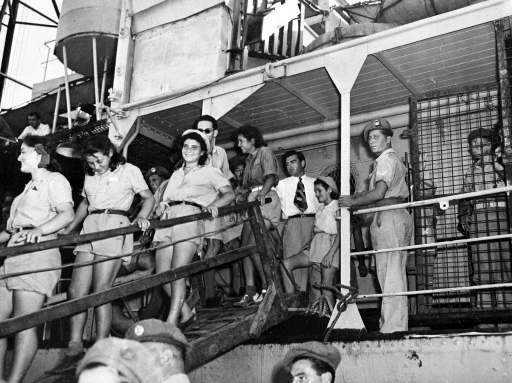 British soldier, armed with a sten gun on guard near the gangway, watches the young happy Jewish orphans as they leave the ship in the port of Haifa, Palestine, Aug. 21, 1947, where they will be bussed to Athlit for medical examination and then sent to their new homes and settlements. 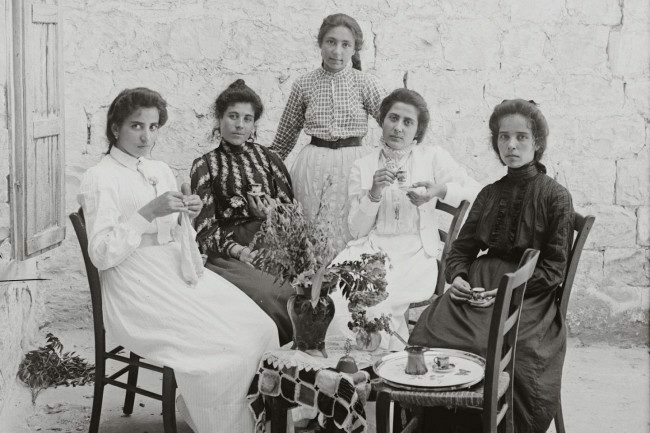 Five hundred orphans, the majority of whom lost their parents during World War II, were interned in Cyprus and brought to Palestine as part of the monthly immigration quota. Young Jewish girls ready to leave the ?Heruth? 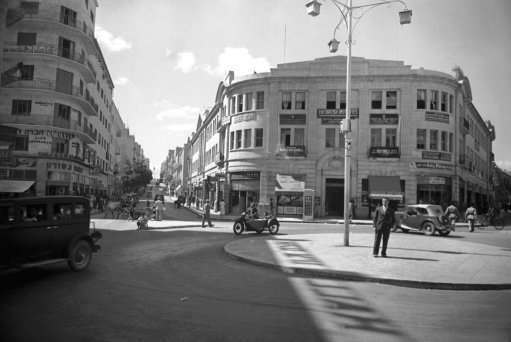 at Haifa, Israel, on Feb. 16, 1947. 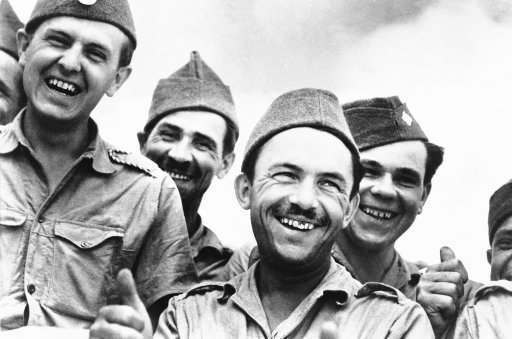 Refugees were in very good humor and while waiting to land for the transshipment to Cyprus, spent their time talking to the soldiers of the 6th Airbourne Division. 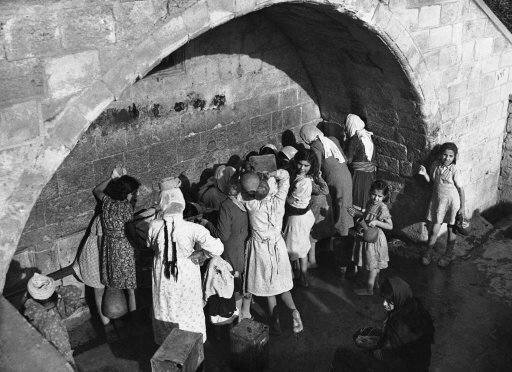 Arab women and children draw water from Mary’ well in Nazareth, Israel on Dec. 7, 1946, the ancient spring which legend relates supplies water for Mary. 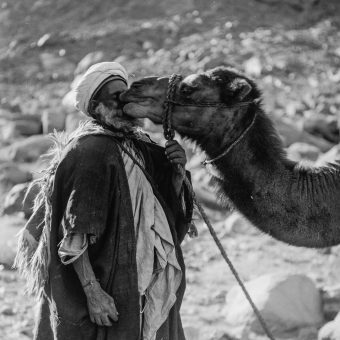 Joseph and Jesus. Among the Jewish refugees who have battled British authorities in recent months, in resistance to British refusal to allow them to enter Palestine, are the men, women and children who came here on the overcrowded Knesset Israel (Jewish Assembly). 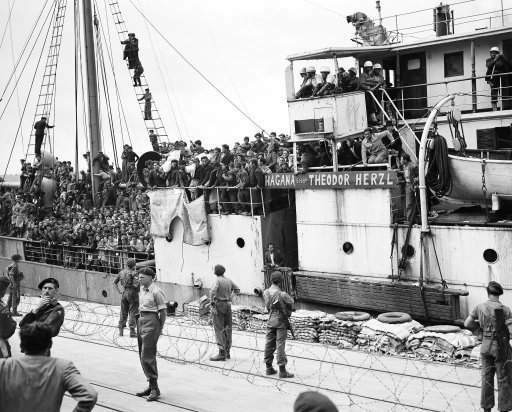 Seeking a homeland after years of Nazi oppression and war, the 3854 refugees on the boat were forcibly transferred to three British vessels waiting in the harbor, for deportation. With tin cans as weapons, the refugees for a time held off the British in a battle in which many of the Jews and British soldiers were injured. 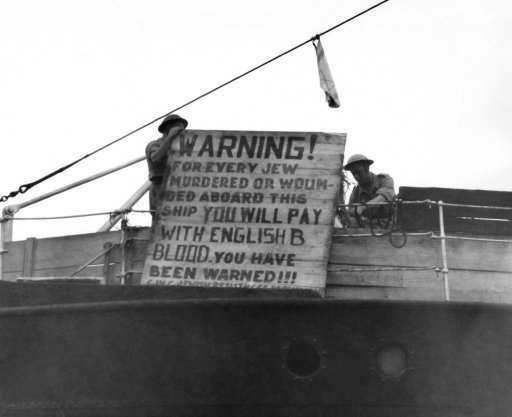 British soldiers, after the transshipment, remove a sign posted on the bow of the Knesset Israel by the refugees in Haifa, Israel on Dec. 4, 1946, warning the British against reprisals for anyone killed or wounded. 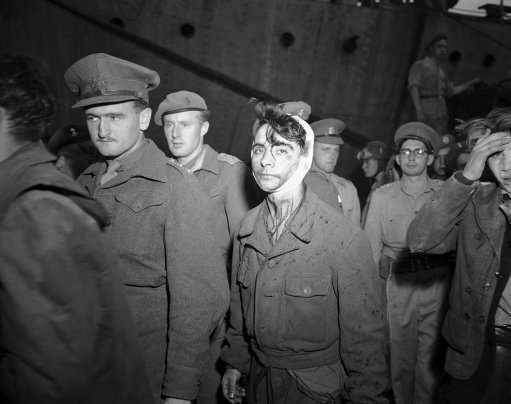 A young Jewish boy, wounded and bloody after the fight with British soldiers on board the refugee ship Knesset Israel, passes a line of soldiers to board the troopship Empire Heywood on Dec. 4, 1946 in Haifa, one of three vessels on which passengers from the refugee ship were deported. 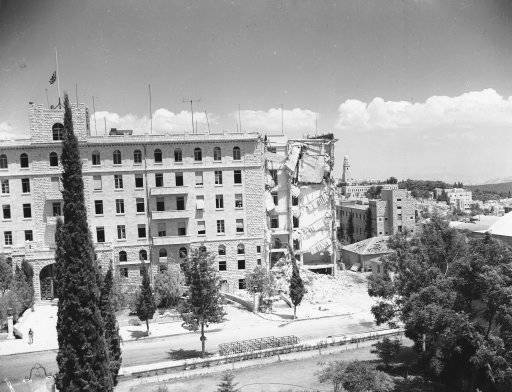 A view of the King David Hotel in Israel after the dust has cleared, Aug. 6, 1946. Sappers had set a demolition charge to break up the cement flooring in preparation to cutting steel reinforcements and pulling down the bomb damaged end of the building. 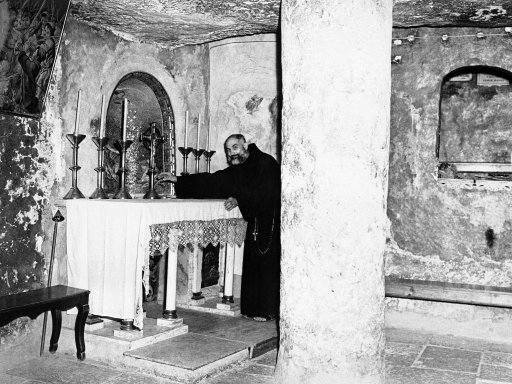 Brother Camillus Liska, Sacristan at the Grotto of St. Jerome in Jerusalem, Israel on Nov. 28, 1945. 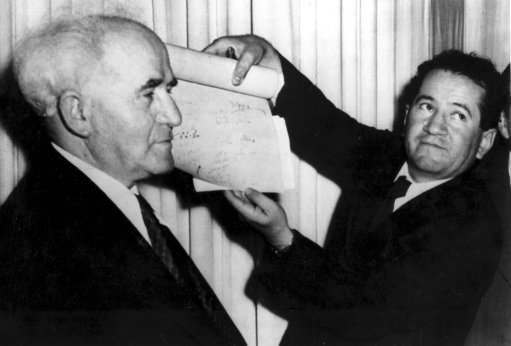 An official shows the signed document which proclaims the establishment of the new Jewish state of Israel declared by Prime Minister David Ben-Gurion, left, in Tel Aviv at midnight on May 14, 1948. The Jews declared independence in the new state of Israel as the 25-year British mandate over Palestine ends. 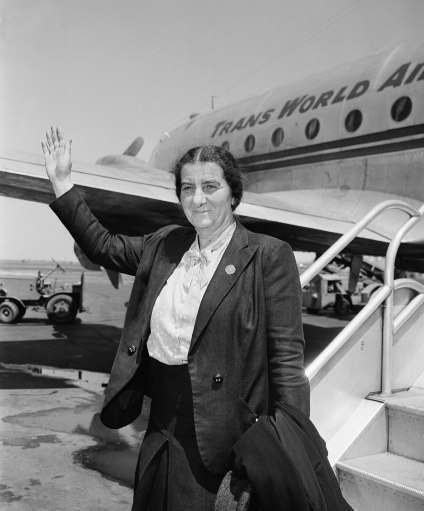 Mrs. Golda Meir is the only female member of the provisional council of the new state of Israel, waves following her arrival at La Guardia Field, New York, May 19, 1948 from Jerusalem. She declared that “if the United state arms embargo is lifted, we can drive the Arabs out in a few weeks.” She added that the Jewish people in Palestine were optimistic of the successful outcome of the war because finances and manpower have been solidly mobilized.